DCR specializes in crisis communications. We work onsite for interagency incident command teams during disasters, creating maps and graphics to help inform and manage the response. As the situation unfolds, the teams uses maps, field observers, and whatever other intel sources are available to figure out what is going on. Our mapping techs work alongside government mapping specialists to put the most current information into map form. 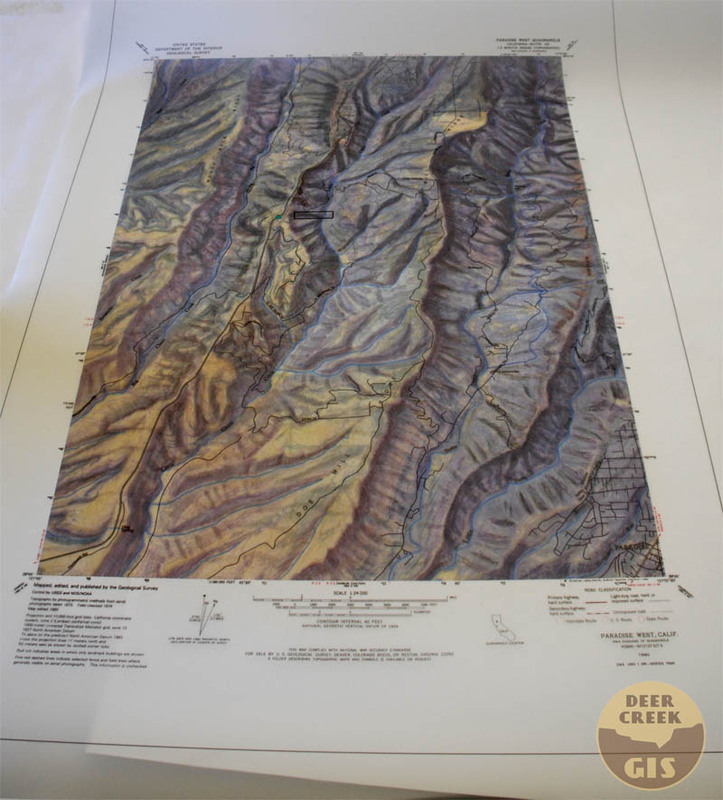 We produce a wide variety of maps on each assignment, including air operations, public information, fire progression, land ownership, briefing, evacuation area maps, and a daily 11×17 atlas which goes out in the field with all of the crew leaders. Map index for the daily fireline atlas. While we work on many different assignments each year, some jobs provide unique opportunities for us to push our cartography limits. 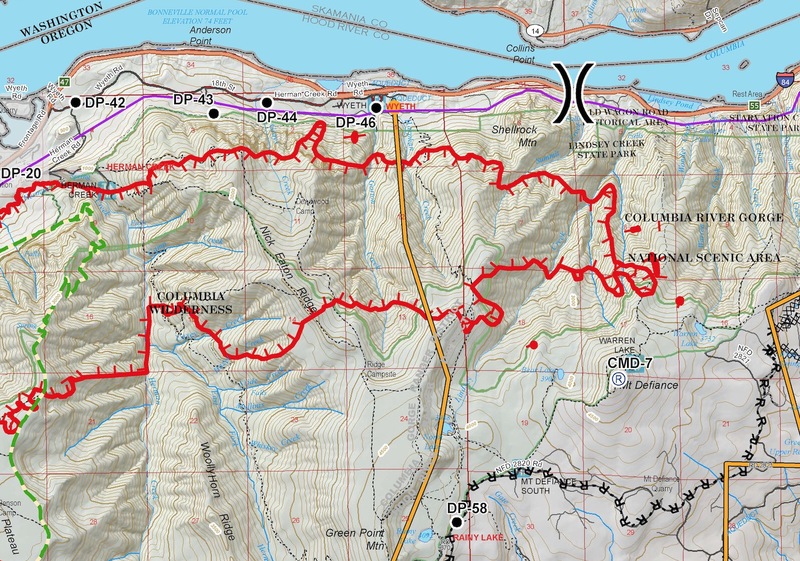 We are currently providing onsite mapping support for the Eagle Creek Fire, which is burning in the Columbia Gorge just East of Portland. 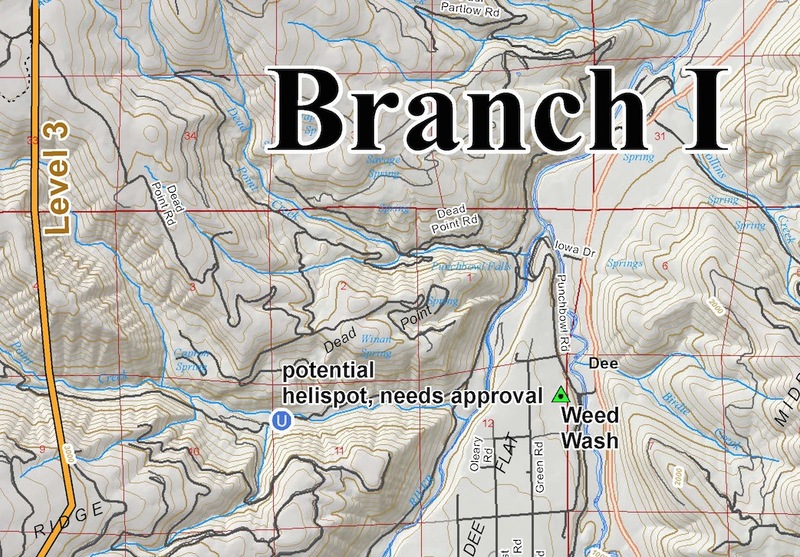 There is an amazing amount of infrastructure, recreation, and topography packed into the fire area, and this makes for interesting map-making. Here are a few images from the main Operations map we are producing each day on this fire. We designed this basemap using a variety of data that we have compiled from public sources over the years. 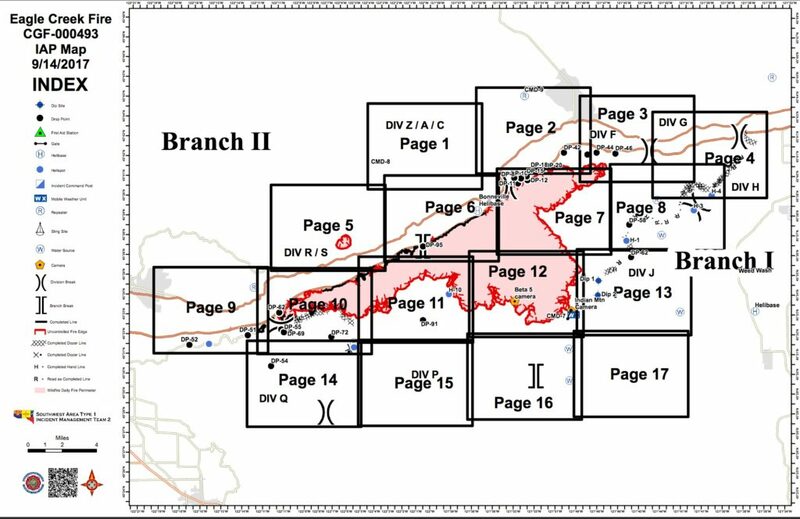 The incident command team is responsible for gathering, vetting, and updating the various firelines and other fire-specific overlays such as drop points, water sources, and other points of tactical signifigance. To download a full-sized map, click here. 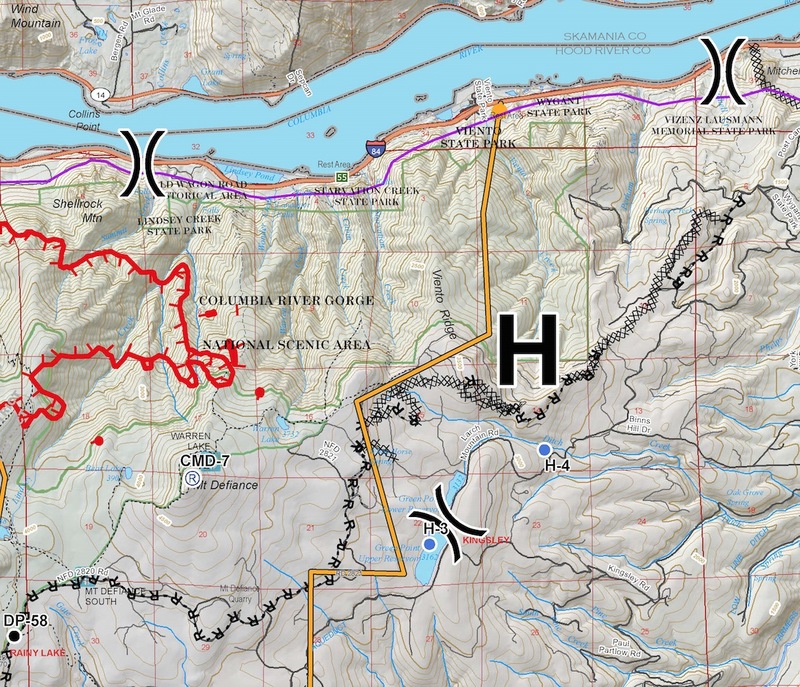 Red hashed lines are the uncontrolled edge of the fire. XXXX lines are bulldozer firelines, and -R-R-R- lines show roads being used as fireline. 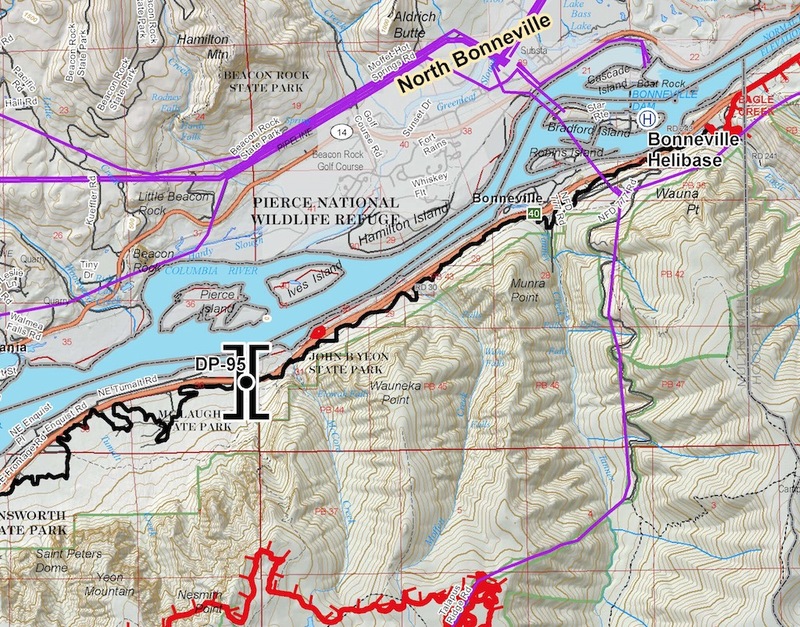 The fire has the potential to burn South into the Bull Run Watershed, which provides drinking water for the Portland Metro Area. The yellow line is a ‘Management Action Point’, or ‘Trigger Point’. If the fire crosses here, mandatory evacuations will begin in pre-designated areas. 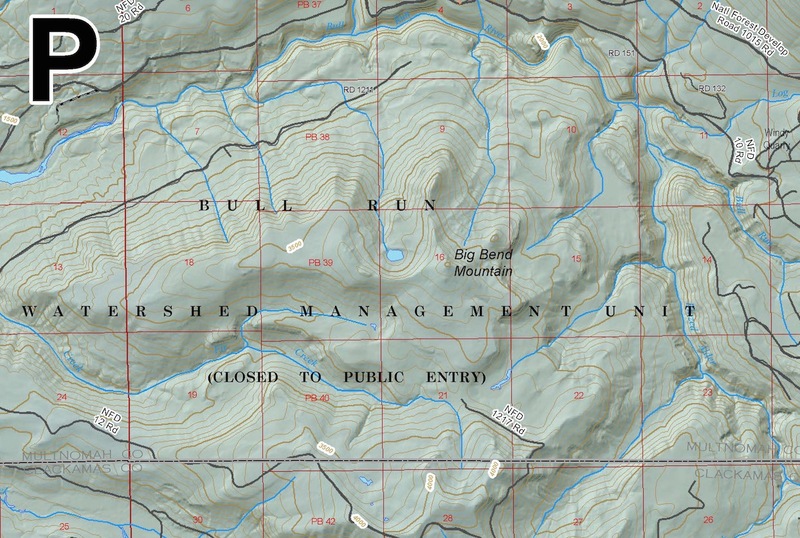 Solid black lines show areas which are considered to be controlled or contained. Sling sites are places cargo can be dropped on longlines from helicopters. 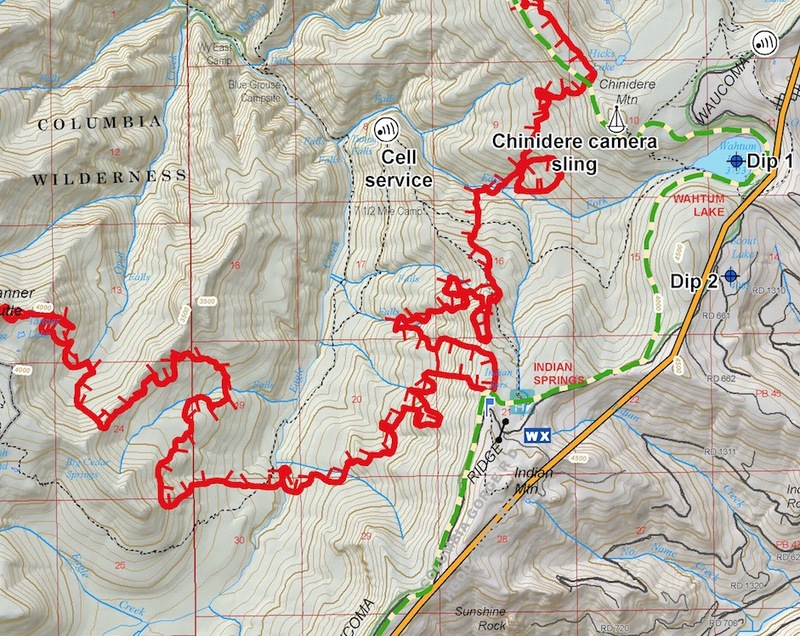 The dashed green line is the Pacific Crest Trail. This fire is using some remote cameras to observe fire behavior. The fire made a 3,000+ acre run to the East last night. Red dots are spot fires ahead of the main flaming front. Lots of data, this is how we roll. We love imagery! Here is what Mount Lassen and the Lake Almanor area looked like after some late snow, May 26, 2016. Click and zoom for full detail. 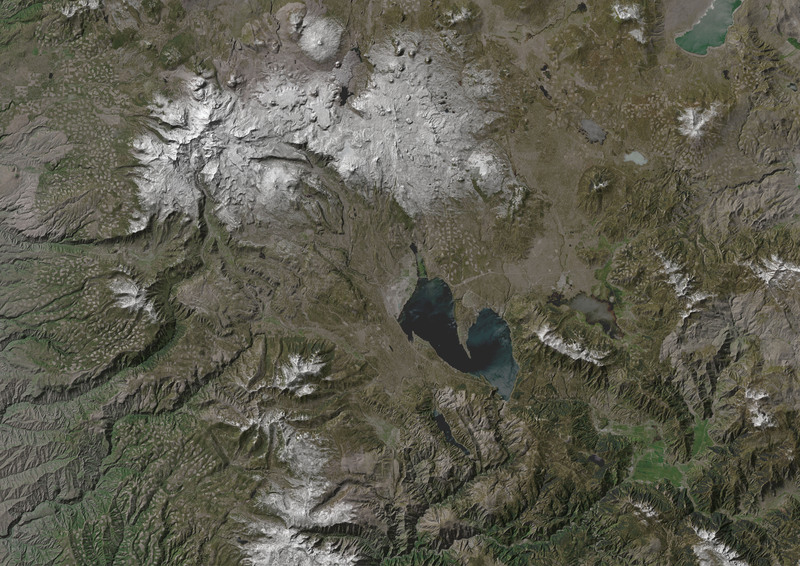 The new LANDSAT 8 satellite has been up for a couple of years now, and the new images that it is sending down are exceptionally clear. Also, the turn-around to download image data is dramatically quicker than in the past. 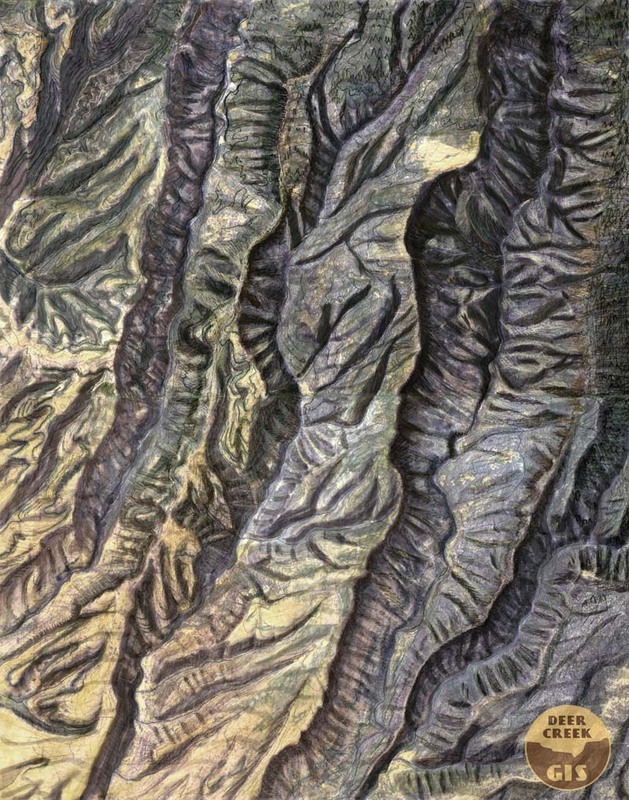 Here is a composite image that we made by mixing visible color bands for last-week’s image with hill shading from a digital elevation model. Prints of this image are available – email us! 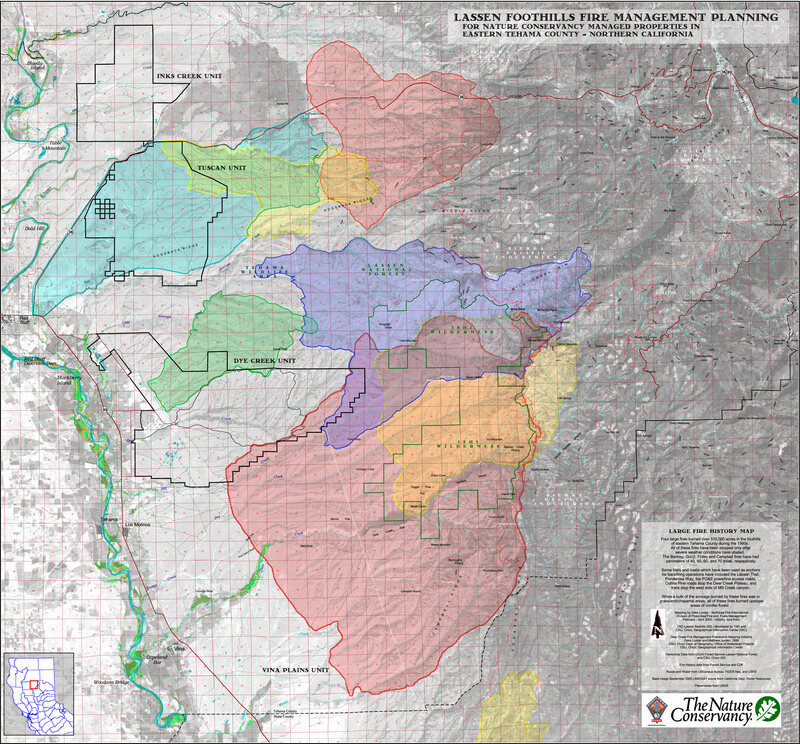 We have been supporting forest restoration planning and implementation work in the Klamath Mountains since 2013. Much of the planning work has been in using GIS mapping to support the different participants in reaching consensus on which areas are the highest priority for forest thinning and prescribed burning work. Here are some writings from one of our collaborators, the prolific Karuk Tribal Forester, Bill Tripp. ‘A Plan for Restoring Fire Adapted Landscapes’WKRP Report Submitted to Klamath National Forest. 2015 TREX underburn near Orleans, Ca. We are also supporting on-the-ground prescribed burning work in the Klamath Country through the Fire Learning Network’s ‘TREX’ Prescribed Fire Training Exchange Program. Our mapping specialists are training TREX participants on the use of GPS mapping and traditional paper maps, and creating the planning maps for each burn area. We are also training GISS mapping specialists on how to map active fires using National standards developed by the National Wildfire Coordinating Group (NWCG). You can catch up with the Klamath River TREX activities on Facebook. Creating defensible space is essential to improve your home’s chance of surviving a wildfire. It’s the buffer you create between a building on your property and the grass, trees, shrubs, or any wildland area that surround it. This space is needed to slow or stop the spread of wildfire and it protects your home from catching fire – either from direct flame contact or radiant heat. Defensible space is also important for the protection of the firefighters defending your home. – Source: http://www.readyforwildfire.org/defensible_space. Destroyed homes and the Angora Fire, 2006, Lake Tahoe, CA. CAL FIRE used to be called the ‘California Department of Forestry (CDF)’. When their primary mission was still to protect commercial timberlands, CDF’s Defensible Space program was intended to prevent house fires from becoming forest fires. As development increased in fire-prone areas, a shift occurred; instead of ‘protecting forests from the people‘, we now aim to ‘protect people from the forest‘. This sense of separation – where the ‘wildland’ character of the land which attracted people out of the cities has become their greatest enemy – is perhaps our biggest obstacle in learning to live with wildfire. It is not working. We need to rethink how we protect communities. As long as Defensible Space is perceived as a ‘contingency’, rather than as a ‘strategic’ action, we will continue to fail to take advantage of the opportunities having defensible, fire-permeable communities present to us, namely, our ability to reintroduce managed fires into wildlands near our communities, or even let naturally-ignited fires do the heavy lifting of managing our wildland vegetation. Each place has its own relationship with wildfire, and for many places, fire suppression is effective in controlling most ignitions. The ‘really big, bad fire’ may only come to town once or twice in a lifetime. The rapid spread of the recent Valley Fire may have surprised most, but history shows us large fires aren’t uncommon in Lake County, or in most of California. 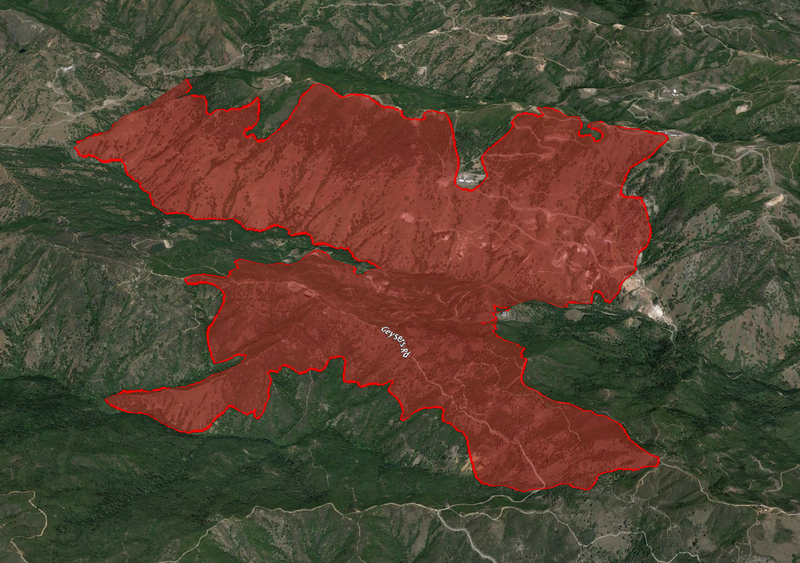 The map below – from the Lake County Website – shows ‘before and after’ satellite images of the areas burned by the Wragg, Rocky, Jerusalem, and Valley Fires, in 2015. The Valley Fire is the one on the left. (Note, the map is easier to use if you click ‘Hide Intro’). The 2015 wildfires in Lake County were fuel and wind driven. While the severity of the current drought certainly contributed to the size of the fires, like most of interior California, there is drought EVERY summer, the vegetation is mainly highly flammable brush and grasslands, and Lake County has a history of regular, large wildfires. This map shows previous large fires which have burned within Lake County. Source: Lake County CWPP. Many of the homes destroyed by the Valley Fire lacked defensible space clearance. The map below was created by Lake County News using damage inspection data provided to them by Lake County. It shows many of the destroyed structures in the communities of Cobb Mountain, Hidden Valley Lake, Middletown and the surrounding areas. Click on the Satellite layer on the map below, and zoom in to take a look at which parcels were destroyed (red dot) or survived (no dot) the Valley Fire. Note many of the destroyed homes had trees right up against the structure. Many of the lost homes are in such dense forest they are not even visible from above. Another striking detail in the damage map, above, is the fact many of the destroyed homes were in the middle of towns, or had their legally-required clearances, with no trees or shrubs near the home. Under extreme, windy conditions, many homes survive the passage of the main flaming front of the fire but are destroyed later by small fires started by flying embers. One way to increase the odds your house will survive an emberstorm is to tidy up junk piles, old tarps, leaves in gutters or roof valleys, and other flammable kindling-type clutter on or adjacent to your house. The (scary) video below shows fire behavior on the 2013 Clover Fire, in typical interior California live oak/gray pine foothill fuels. Like the Valley Fire, this wind-driven fire also destroyed many of the structures in its path. The structure in this video has good clearance, including a bulldozer line between it and the fire. Even so, this house burned. One consequence of increased development in the wildlands is when a fire starts to threaten homes, nearly all of the incoming firefighting resources end up parked in driveways protecting homes, waiting for the fire to come to them, instead of going out to where it is burning and putting it out. This is the difference between ‘structure protection’ and ‘perimeter control’, and it results in larger fires. When an IC orders ’40 engines, any type’, they are really saying ‘I need firetrucks in here right now to save houses, I don’t care if they are heavy urban engines that can’t leave a paved road, because they are not coming here to put the fire out’. (Obviously, there is nothing wrong with saving peoples’ homes – defensible space makes it easier for firefighters to do more with less). Living in wrong-relationship with wildfire puts you, your belongings, and our emergency responders in harm’s way. Anything wildland-dwellers can do to make their house into one that ‘doesn’t need saving’ frees up resources and people to do entirely different things with their time; like restoring fire to our forests, or staying home to play with their kids. Improving Wildfire Safety for Your Home. The best thing we can do to improve the safety for individual homes is to address the conditions in the surrounding forests and wildlands. The single best reason to fireproof your home is so we can collectively get to a point where the public is comfortable with wildfire as a natural occurance, and we no longer need to extinguish every new ignition. In the meantime, defensible space is a step in the right direction, and it is also the law. California Public Resource Code 4291 requires homeowners in wildfire-prone areas to maintain defensible space around their dwelling. 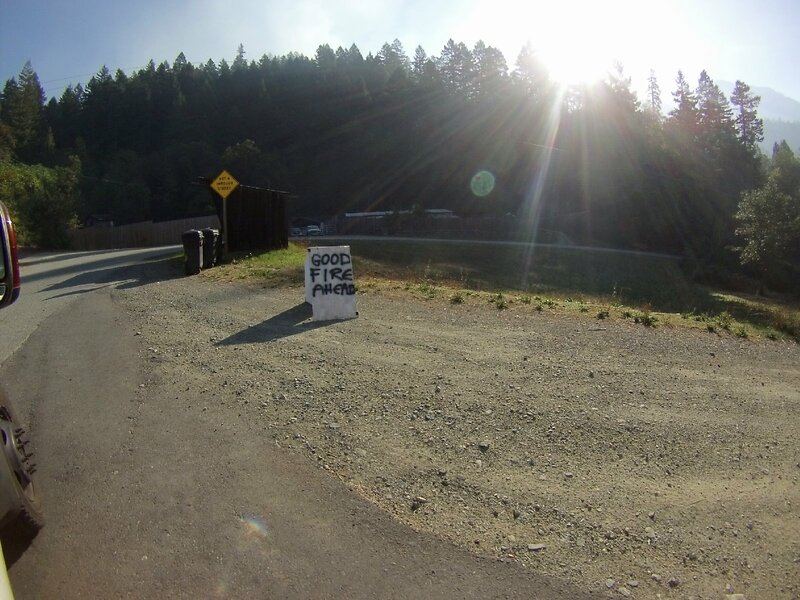 CAL FIRE conducts defensible space inspections in many areas, and may require landowners to clear brush and hazardous fuels if their property is not in compliance with PRC 4291. 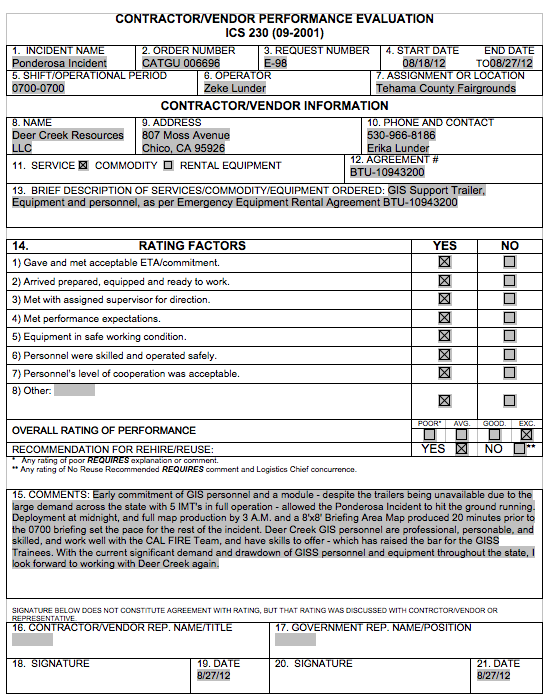 To see the factors CAL FIRE evaluates during their inspections, you can download the CAL FIRE Defensible Space Inspection Form. Roofing – Shake roofs are a leading cause of home loss in wildfires. Research show homes with non-combustible roofs and clearance of at least 30-60 feet have a 95% chance of survival in a wildfire. Vent Openings – Remember, most destructive wildfires happen when it is very windy. Screening of vent openings with steel screens will prevent flying embers from entering into attics and crawl spaces. Smaller screen sizes (1/8th inch) are more effective at keeping embers out, but can also plug with dust, decreasing their ability to actually do their job of ‘venting’ the attic. Siding – Untreated wood siding significantly adds to the radiant heat and flame impingement exposure risk from wildfire. Eaves – Eaves often add to the home’s exposure from wildfire by trapping direct flames and embers. Building construction practices should be modified to reduce the susceptibility of eaves to direct fire and firebrand ignition. Decks – If treated and maintained properly, and with adequate defensible space from vegetation, most solid wood decking material is fire resistant enough to withstand the short term heat load. Research shows that treated natural wood products must be well maintained to prevent cracking or rotting and maintain their fire resistance. Many new materials (synthetics) ignite more easily than wood and have a rapid structural collapse when subjected to high heat loads. On slopes, the area beneath decks catch flying embers. It is a good practice to screen these areas to keep embers from blowing in during a fire. Detached Structures – Flammable Structures (e.g. storage, wood & tool sheds, and fencing) without separation from homes, place those homes at risk of loss as they can act as ‘wicks’, carrying fire to the house. Woodpiles – Woodpiles without adequate separation expose structures (homes and other buildings) to sustained heat and fire. During the fire season, roughly May through October, wood piles should be located away from residences. Propane Tanks – Propane tanks should be clear of flammable vegetation for at least 10 feet. Junk – Ratty tarps, piles of lumber, old boats, and anything else that can be ignited by a flying ember should be kept away from your house. Research has found prep work done in the zone within 10′ of the house is the most important in determining whether or not a house will burn. There should be at least a couple of feet of fireproof ground cover – dirt or gravel – right up against the home. In many places with small lots, you can do everything right and still lose your home if your neighbor hasn’t done their part. While maintaining the shrubbery and trees that give you privacy is always a high priority, there are many ways you can increase the survivability of your home, and do your part in maintaining community fire safety without creating a moonscape around your home. We work with communities to help them map out their wildfire hazards, and develop on-the-ground projects to improve community wildfire safety. We recently completed two different wildfire hazard reduction plans for forested communities in Plumas County. 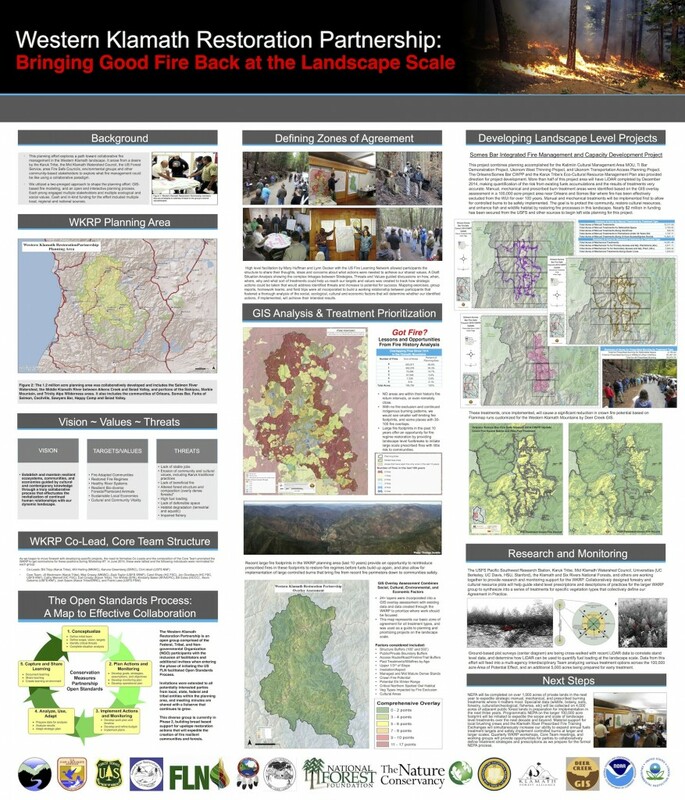 The slideshow below captures some of our recommendations from those projects, providing vegetation management prescriptions to decrease the risk of extreme fire behavior in Sierra/Cascade forests while maintaining plant diversity and wildlife-friendly conditions. Click here to view a larger slideshow. Contact us if you’d like to learn about more resources for community wildfire safety and prescribed fire. California’s drought brings unprecedented challenges for landscape managers. 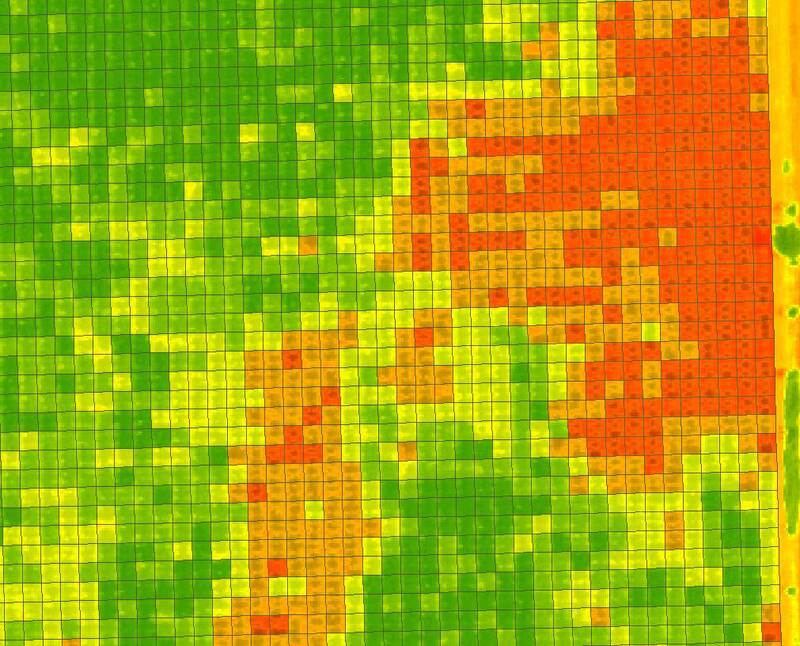 What technical tools are available for mapping large turf areas? How can we get a quick snapshot of water use across an irrigated landscape? How to prioritize areas for conversion from irrigated turf to xeriscape? 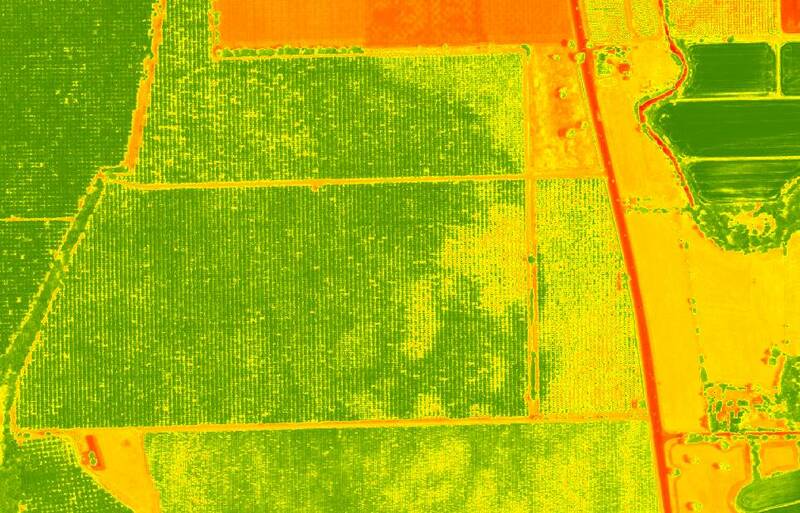 DCR uses infrared aerial photography to map large turf areas and audit irrigation efficiency. Our maps show drought-stressed areas, and identify areas that are moist and potentially over-watered. We do this work at a variety of scales – ranging from mapping all turf within a city or district, down to detailed turf-condition maps of specific parks or school campuses. Here are some high-resolution images showing natural color and our enhanced turf vigor imagery for a park in Walnut Creek. 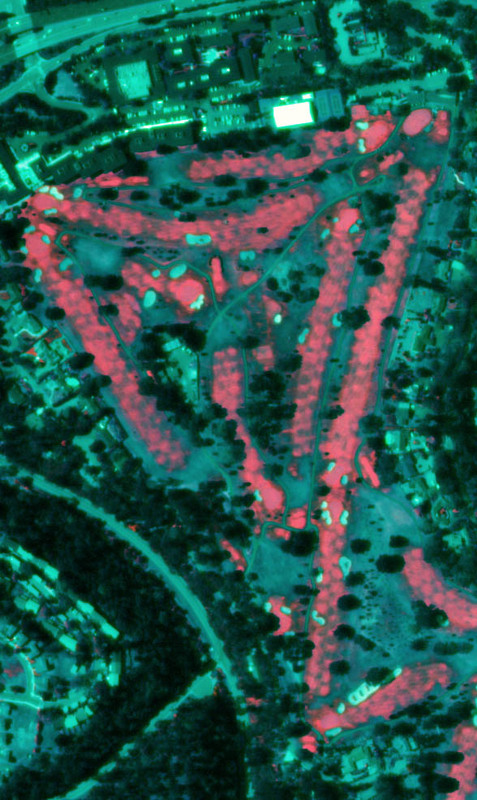 In the enhanced image, darker tones of red show more vigorous, healthy grass. 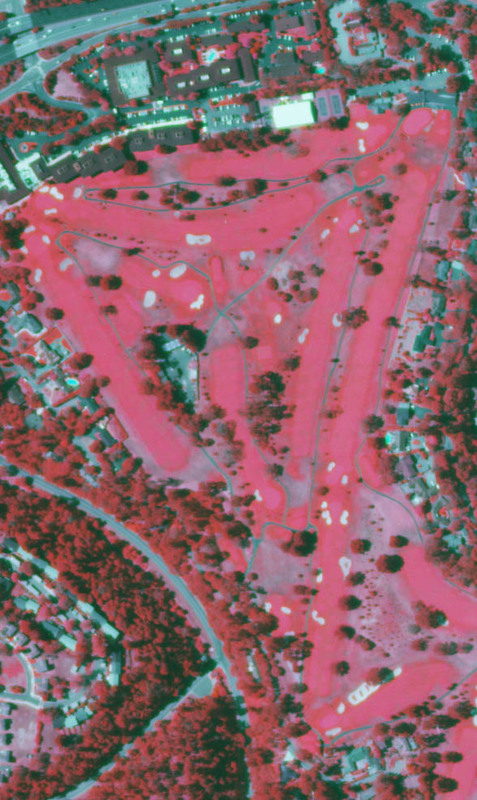 These two example infrared images show a golf course – one has been analyzed to highlight turf vigor/soil moisture. Original infrared photo of a golf course. Enhanced infrared image. Hot pink areas are moist, and potentially overwatered. Individual sprinkler heads can be mapped and identified in this image. 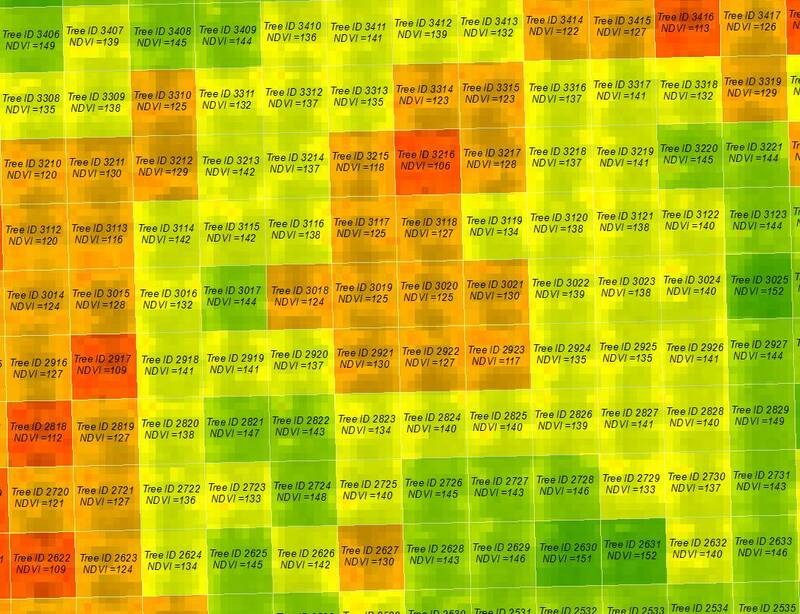 We can use similar imagery to map condition on your turf landscapes, help to map out strategies for turf conversion, and equip field crews with simple, free phone or tablet apps that allow them to navigate directly across these images or implement turf conversion projects. We can also help you to map the changes that you are making in your turf cover, demonstrating your compliance with new State-mandated water-use reductions. Contact us for a free consultation about mapping and managing your turf landscape in this time of drought. We have been working through the Mid Klamath Watershed Council on community-based wildfire preplanning projects for about a year and a half now. They just published a poster that features some of our GIS analysis and cartography work. We enjoy working with MKWC because they are successfully getting good fire back on the ground a very grassroots way. The King Fire, burning on the El Dorado National Forest made a huge run on 9-17-2014, burning over 15 miles and growing 50,000 acres in one day. Here is what it looked like from about 110 miles North. King Fire, 4 pm on 9/17/14. 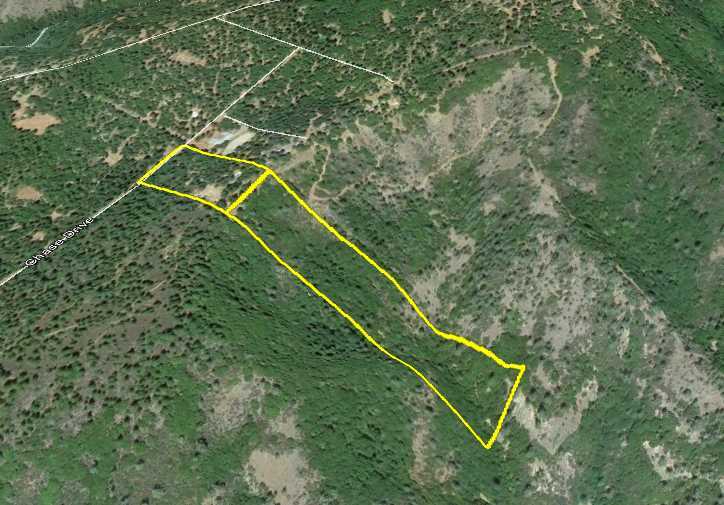 Deer Creek Resources, in partnership with Wildland Rx and the Yuba Watershed Protection and Fire Safe Council, is developing the Yuba County Foothills Community Wildfire Protection Plan (CWPP). This project provides a snapshot of current wildfire protection challenges and capabilities, identifies and prioritizes areas for hazardous fuel reduction, and makes recommendations on things that residents can do to help protect their communities from wildfire losses. We used a community-driven collaborative mapping process to develop this plan. We gathered mapping data and aerial imagery and used it to create large poster maps for each fire district in the Foothills. We also drove about 600 miles in the area, taking photos, mapping high fire hazard areas, and identifying good places for fuel reduction projects. Then we convened public meetings and empowered locals to draw on the maps, showing us where they perceived wildfire problems, telling us stories about past fires that they had experienced, mapping noxious weed infestations, and drawing in overgrown or washed out roads. We used the community maps to develop the written document, and added local placenames and landmarks to our report maps. DOWNLOAD THE DRAFT CWPP FOR REVIEW! The Draft CWPP maps can be downloaded as an 11×17″ PDF map book here. Deer Creek Resources is now providing coordination for the Plumas Fire Safe Council. Here is a press release from the Council! The Plumas County Fire Safe Council (PC FSC) has selected Nils Lunder of Indian Valley to act as their new coordinator. Nils lives with his wife and two sons on their small ranch outside of Greenville. He grew up in Westwood and returned to the region after receiving a degree in Environmental Science from Humboldt State University. 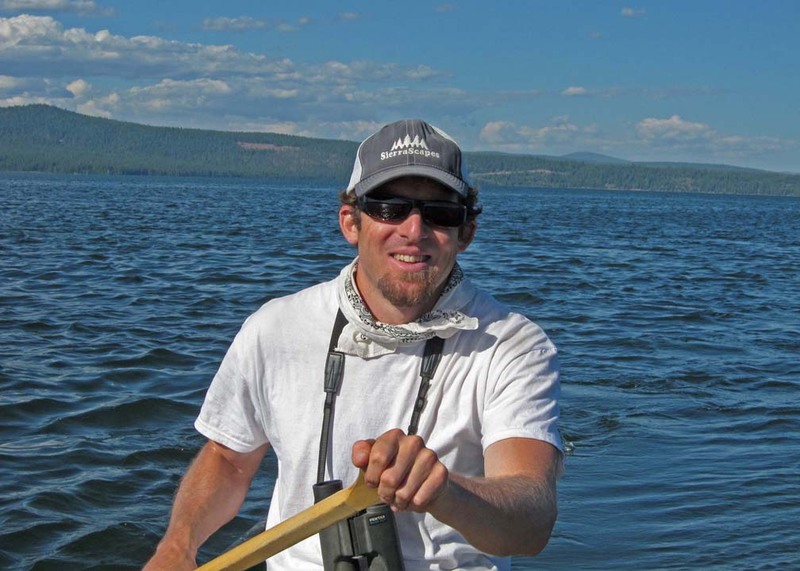 Nils has worked throughout the Feather River Watershed on a variety of projects including wildlife and fisheries surveys, watershed studies, forest thinning, project monitoring, stream restoration, environmental education and community outreach. Nils is a volunteer in his community and is on the Board of Directors for the Feather River Resource Conservation District. The Coordinator services will be provided by Deer Creek Resources (DCR) to the Fire Safe Council through a contract with Plumas Corporation, which serves as the fiscal sponsor for the Council. Nils is an employee of DCR which is owned by Zeke and Erika Lunder of Chico, California. DCR was founded in 2011 to provide wildfire management and planning services, but Zeke has been involved with land management projects and mapping since 1990 when he worked as a seasonal forestry tech on the Lassen National Forest. 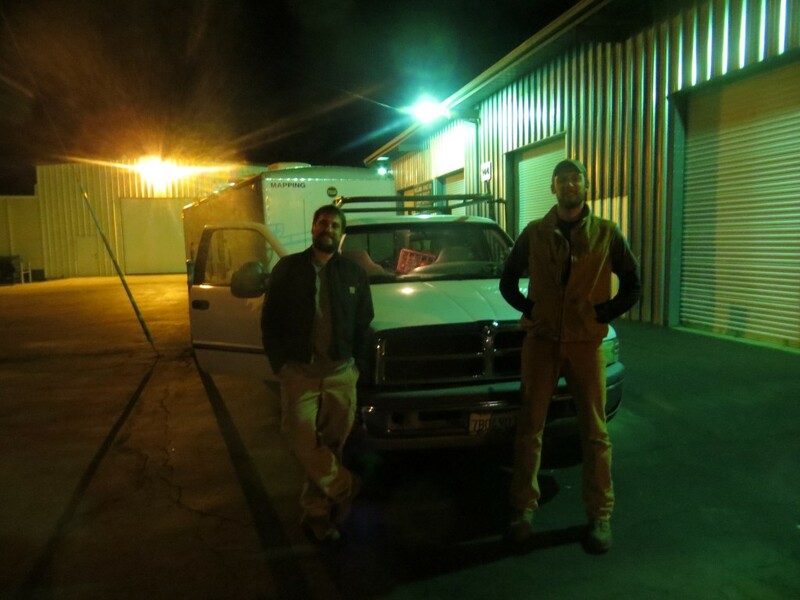 Since then Zeke has worked on wildfires and fuels management projects throughout the Western United States. 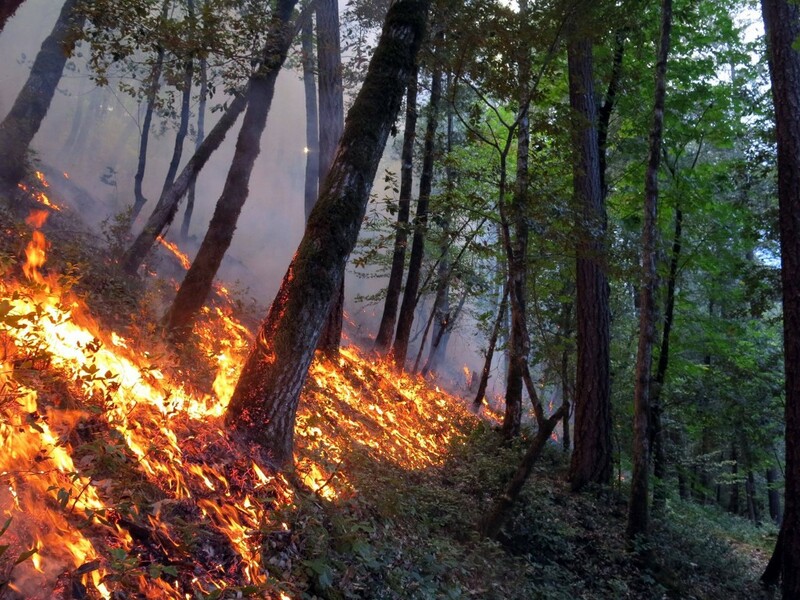 DCR is currently working with the Yuba Fire Safe Council and the Mid Klamath Watershed Council to assist them with the development of their Community Wildfire Protection Plans. 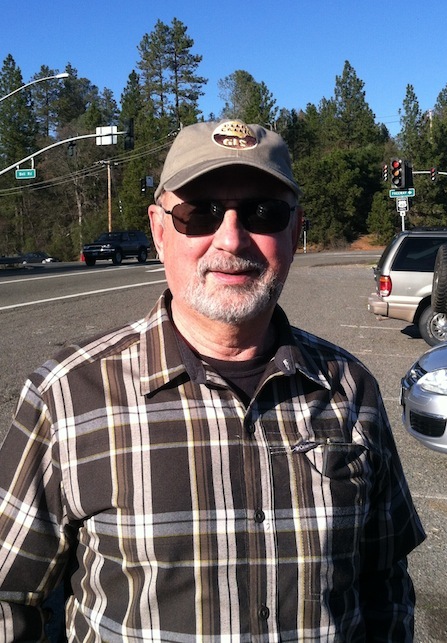 Zeke was a co-author of the Plumas County Hazardous Fuel Assessment and Strategy in 2004; he has extensive knowledge of the fire history and the landscape of Plumas County. 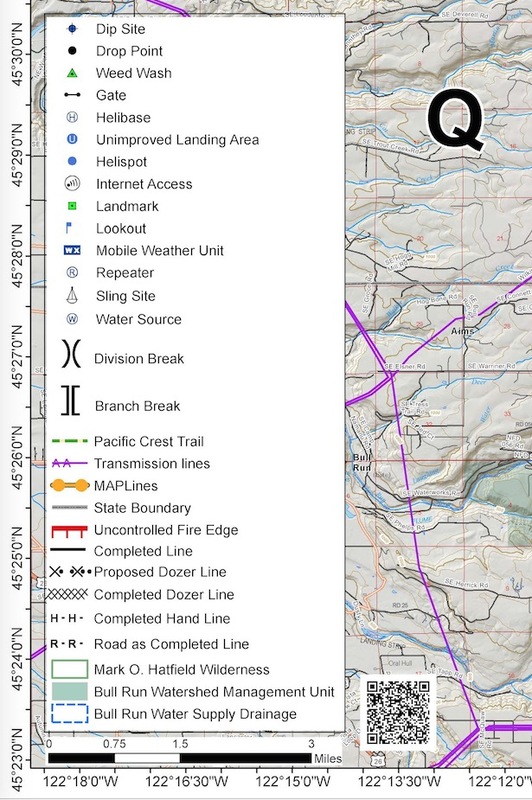 Check out the DCR website for additional information: http://www.deercreekgis.com/. DCR is excited to be serving Plumas County residents and they are grateful that the former Coordinator Jerry Hurley will be working with them to ensure a seamless transition as the PC FSC enters this new era. Jerry brought his extensive knowledge of fuels management, fire ecology, and his connections within the wildland fire community from a long career with the United States Forest Service. After 12 years of running the Council, Jerry is ready for his second retirement. Since 1998, the Plumas County Fire Safe Council (PC FSC) has been serving private landowners in Plumas County. Under the leadership of Jerry Hurley and board Chair Mike De Lasaux, the Council has assisted in developing and funding hazardous fuels reduction projects on over 2,500 acres of private lands in the wildland-urban interface (where the forest and the homes meet). The Council currently has numerous other projects in the works which will treat an additional 450 acres. For additional information about the Council you can visit our website: http://www.plumasfiresafe.org/. 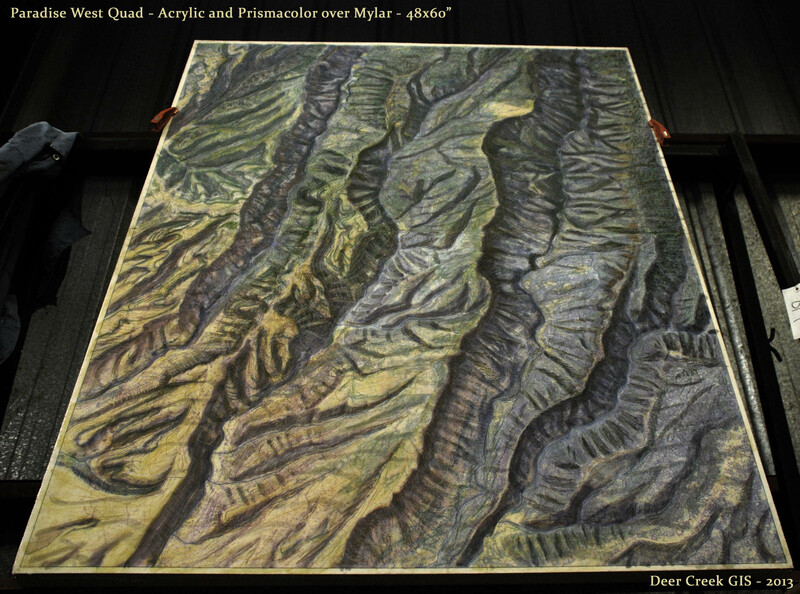 Feel free to contact Nils Lunder at nils@deercreekresources.com. We have been using satellite imagery and remote sensing for the last 15 years on a wide-variety of mapping projects, and are interested in collaborating on efforts that use mapping to improve the efficiency and effectiveness of local water use and management. 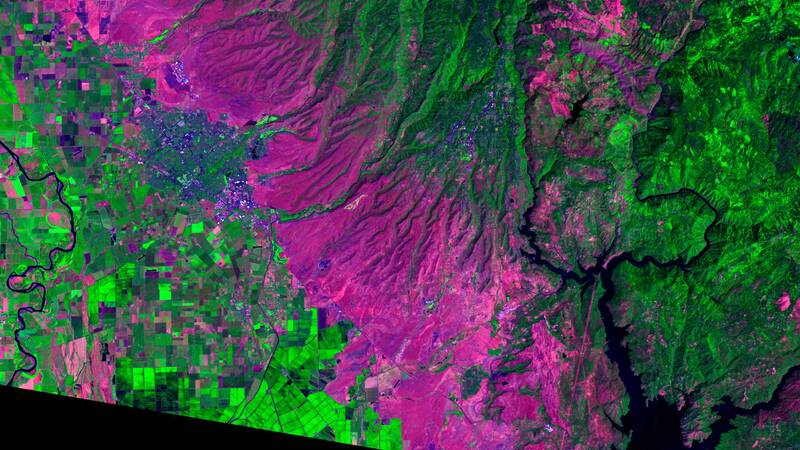 Here are some example images that we have built recently using multispectral LANDSAT imagery. Purples and pinks are hot in this image. 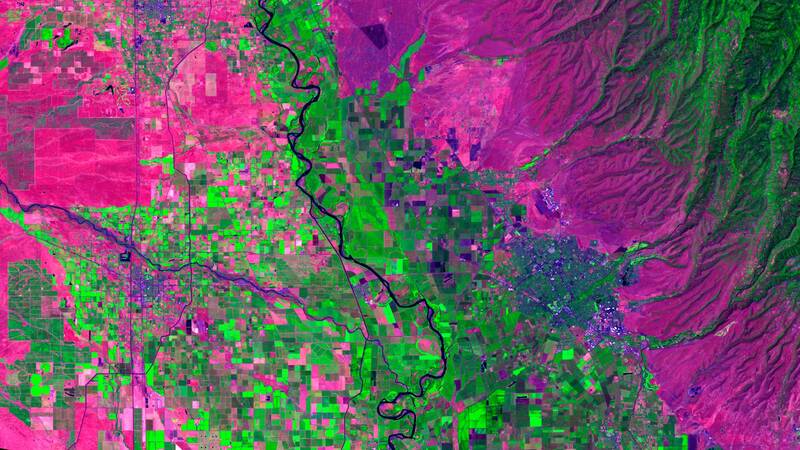 Dark greens are orchards, and bright greens are field crops and alfalfa. 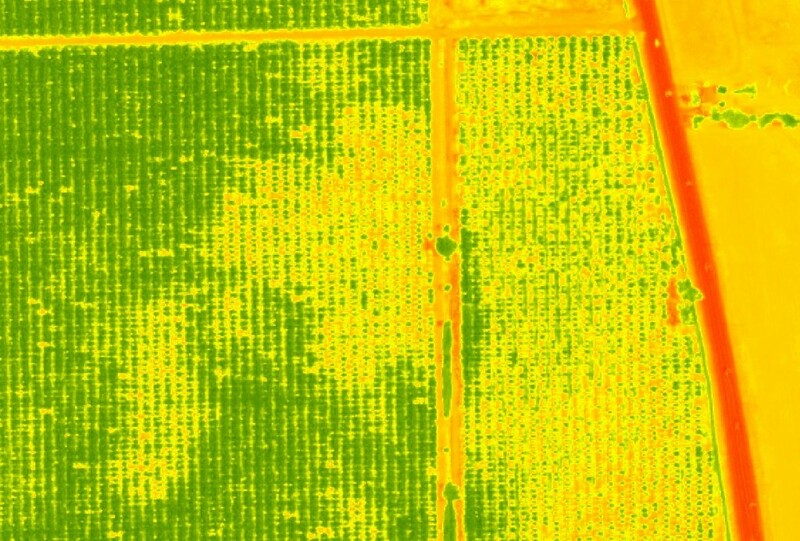 Rice shows up as dark green where it is still flooded, and as bright green where the fields are being dried out for harvest. Basically anything that is irrigated is shades of green, pink fields are either grazing land, fallow fields, or dry wheat. 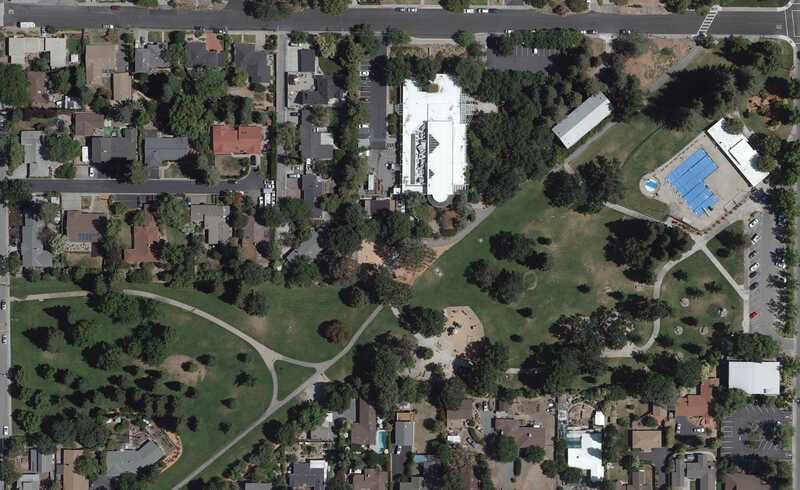 There are some interesting details in the imagery – for example, on center left, you can see how hot the gravel bars are in the stream corridor of Stony Creek, or the tarmac is at the Chico Airport. Bidwell Park shows up as a cool island among the hot streets of Chico, and you can see just how scorching Southeast Chico is with all of the parking lots and no large trees. 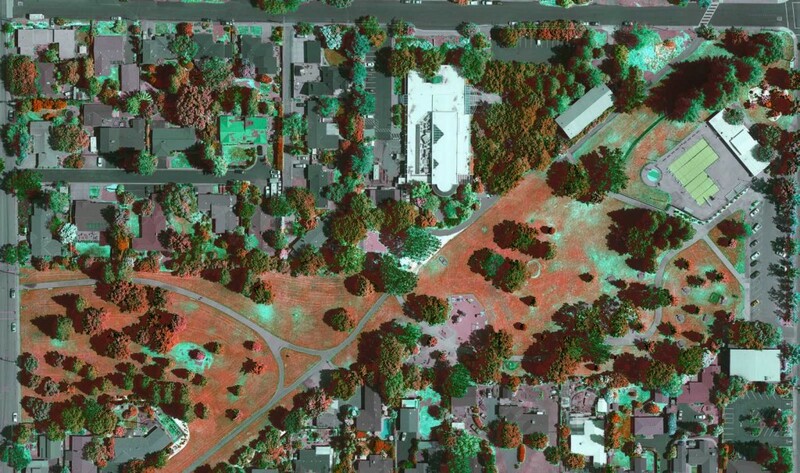 Also, the Cohasset, Mangrove, and Nord Ave corridors in Chico show up as very hot in this August 2011 image. We are interested in developing new applications for this technology. Some of the ideas that we are interested in pursuing include using these broad-scale tools to look into optimizing water temperatures in rice fields, and more accurately inventorying water and land use across multiple jurisdictions. GERLACH AND HIGHWAY 395 IN EASTERN LASSEN COUNTY. I found this image. Nobody I know up there can remember this happening before. 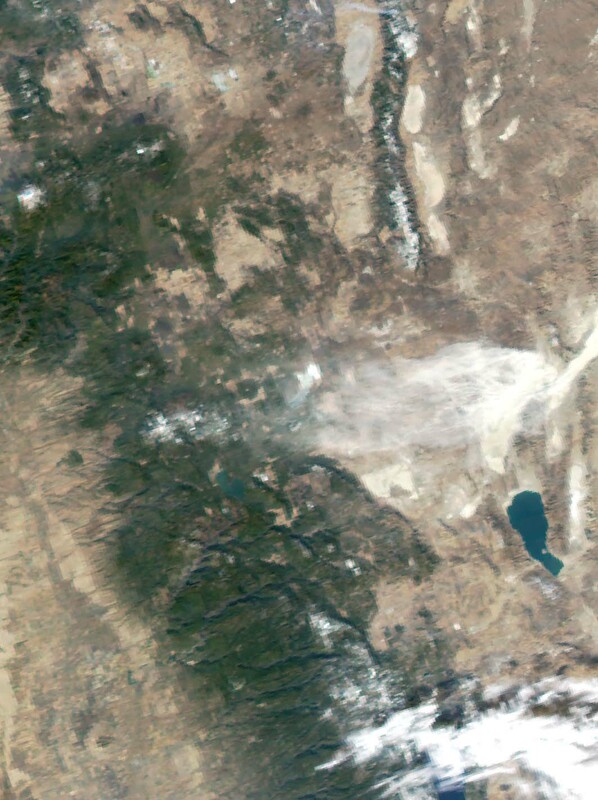 MODIS satellite image taken around 1pm on 1/23/2014. This is something that we can do for most places in the country. We can also send you an overlay file that you can use to see your property in 3d using Google Earth. Prices start at $100 for one parcel, and $20 for each adjoining parcel. We just ran a quick wildfire mapping assignment in Sonoma County. The McCabe Fire was wind-driven, and burned about 3,000 acres in a sustained wind-driven push. 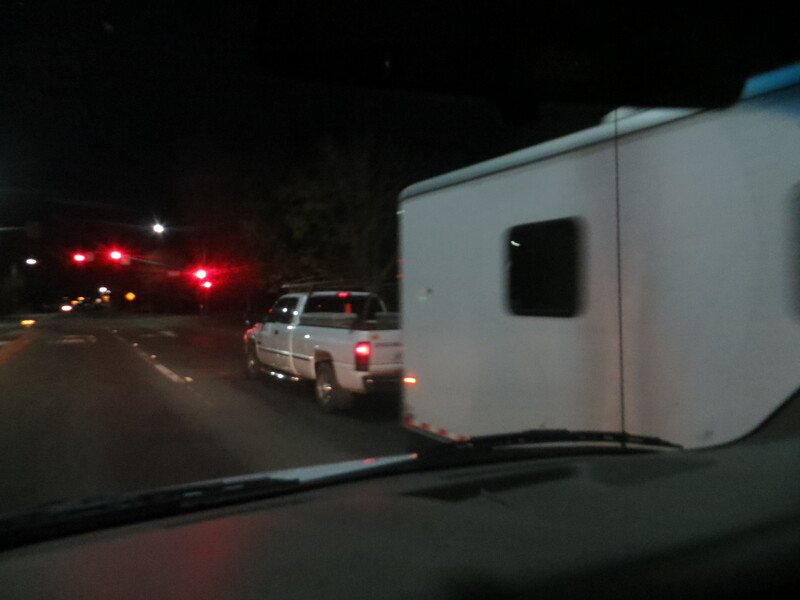 We launched our larger mapping trailer – ‘Walnut’ – and a crew of two for a quick assignment. At the fire camp in Cloverdale. NBC News ran a piece about the fire which featured some video shot inside of our mapping unit. Just got off of a mapping stint on the Swedes Fire. 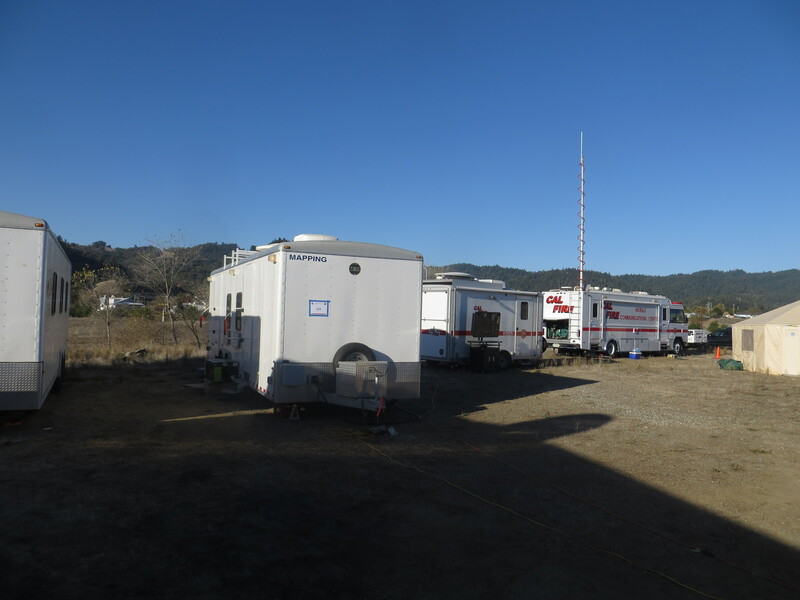 It was a good assignment – the CAL FIRE team that we worked with was solid, and all of the systems worked well. 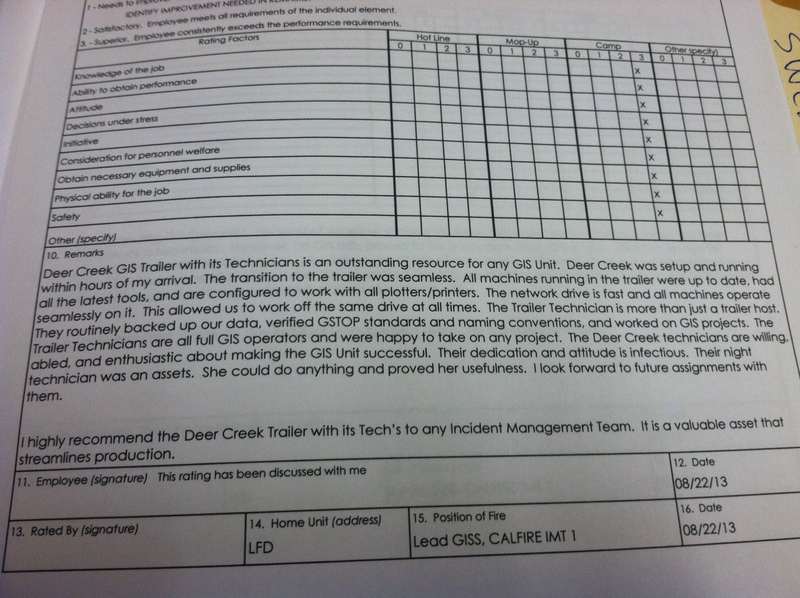 Here is the evaluation that we got from the team’s lead GIS tech, Tim Werle. Deer Creek, and the Ishi Wilderness in particular are real wildfire country, with a history of frequent large fires. I wrote a wildfire management plan for Deer Creek Watershed Conservancy in 1999, and then did another project for the Nature Conservancy in 2003 where we helped them to lay out burn units and establish some objectives for using fire to manage their rangelands. Looking NE up Deer Creek, over the Ishi Caves area. Top end of Cohasset Ridge is on the center-right. Beaver Creek Pinery is in center of upper-left 1/4. 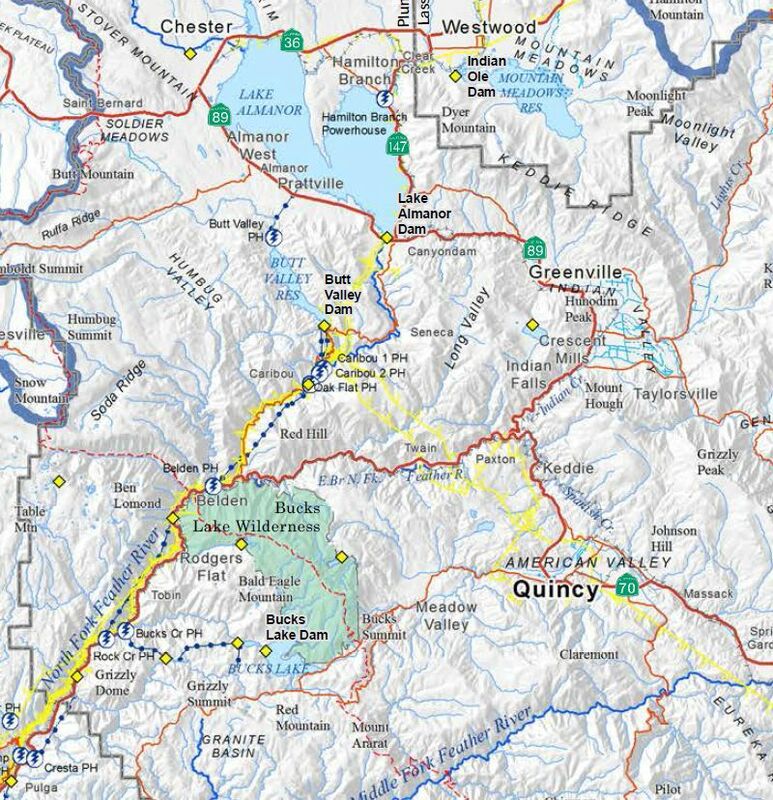 The Campbell Fire (1990, at bottom) is in Red, the Barkley Fire (1994, overlapping Campbell) is Yellow, Gun 2 Fire (1999, center) is Blue. An aerial panorama we shot of the same area in 2008. View over Mill Creek, Boat Gunwale Creek, Lassen Trail, and Big Dry Creek, Ishi Wilderness, Tehama County, California. Deer Creek Canyon is at the far-right, just under the wing-strut of the plane. Click on the image and hit the ‘F’ key to view this panorama in fullscreen mode. These canyons in the Lassen Foothill funnel East winds, and fires often make their biggest runs downslope runs at night when the air sinks down off of the high country around Mount Lassen. The roads up into the foothills from the Valley are studded with babyhead-sized volcanic rocks – making ‘3 miles per hour’ a good pace. As an old fire captain friend put it ‘You bounce up and down through there for 2 hours to find out that the fire is actually two ridges over’. I had the lug nuts of my ATV work themselves off about 8 miles up into Dye Creek but found a cowboy that loaned me a vise grip. The best vehicle for this country is a horse. The historic Lassen Trail runs up the divide between Boat Gunwale Creek and Big Dry Creek. 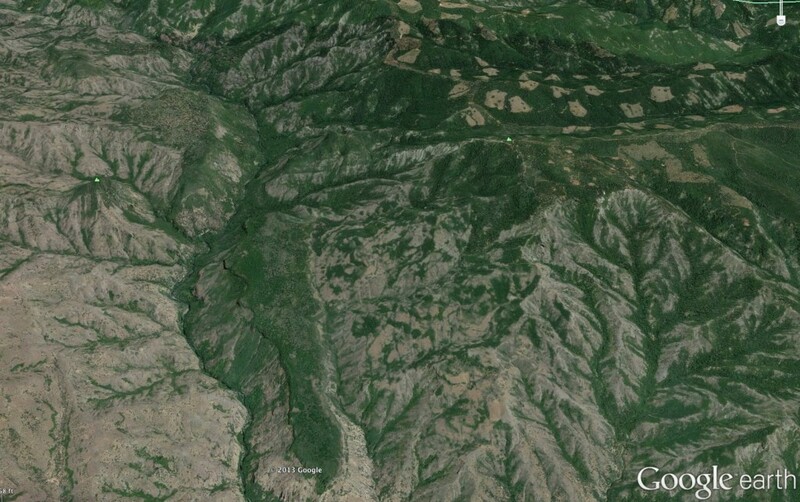 It is in the center of the image above, and has been used as a firebreak on many past large fires in this area. Most of this image is wilderness, and bulldozers are not usually allowed. There are some really cool ‘Pineries’ in the Deer Creek Watershed – Ponderosa Pine forests growing on flat ridgetops that have had a history of frequent fires thru the past century. Researchers use these sites to map and model what a fire-adapted Pine forest should look like. 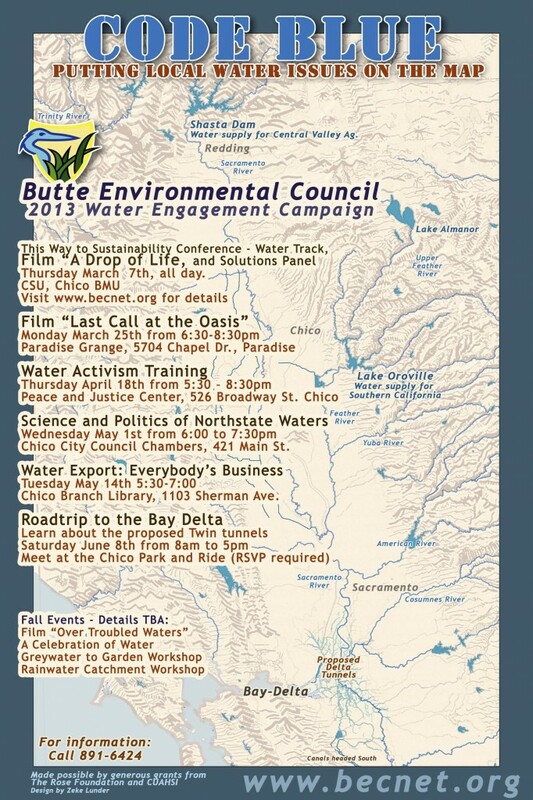 We just finished a poster design for the Butte Environmental Council. 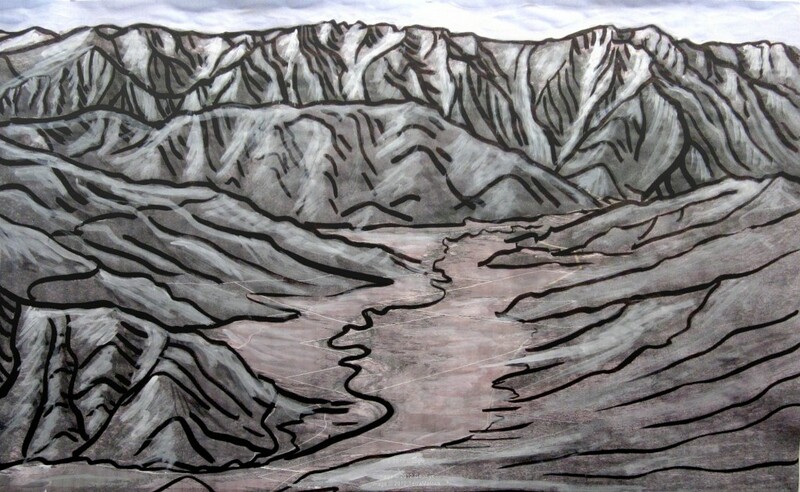 The background graphic is from a hand-drawn map that we created with Sharpie at 36×48″. Our longtime friend and colleague Barry Callenberger has joined our prefire planning and fire behavior crew! Barry brings with him over 40 years of wildfire management experience. For a full bio click here. We have added new pages to our website that highlight our wildfire pre-planning and hazard assessment skillsets. I have always loved Genesee Valley, In Plumas County, California. Though the valley lies at about 3,500 feet elevation, Grizzly Peak rises another 4,000 feet in about a mile, making the meadows below feel like our own Northern California version of Montana or Idaho. 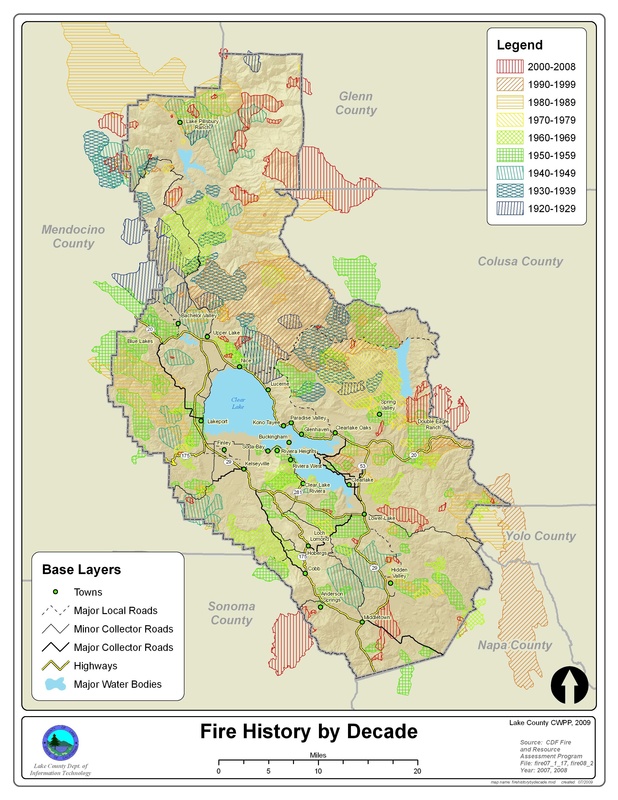 My brother is working as a land manager for the Feather River Land Trust. They own the Heart K Ranch, and manage other conservation lands in the Upper Feather River Watershed. This illustration is an aerial view of the ranch from the East. 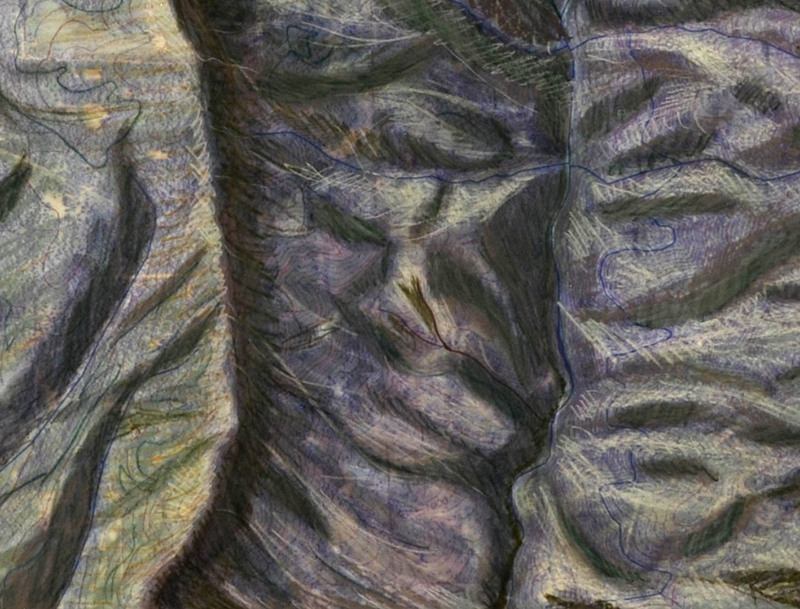 The original for this piece is about 48×36″, and its intended final size is as a postcard. 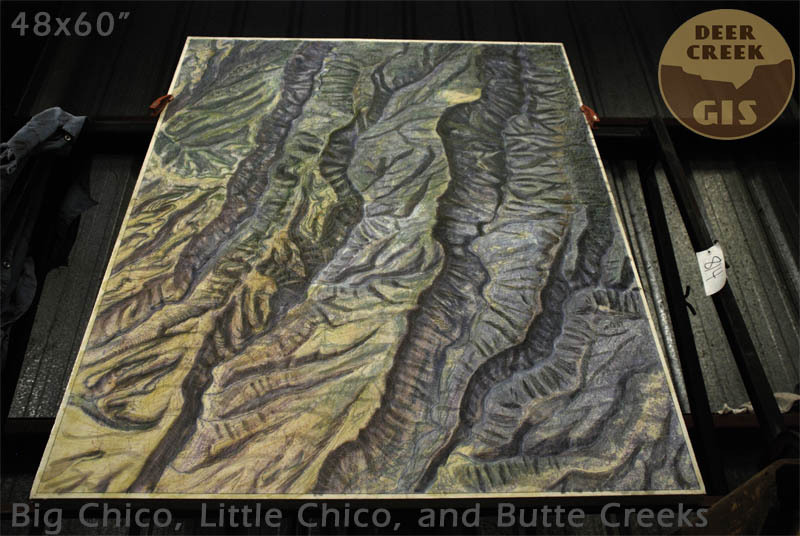 We like these sorts of hybrid projects – where Google Earth and inkjet plotters meet black ink on a paintbrush. The classic cartographer’s trick is to work big for a small final piece, and we are scheming on some really large pieces. We have been creating wildfire and disaster management presentations for the last 15 years, mainly for lectures that we do at college geography departments and for non-profit conservation and planning groups. The images below are a few examples of info graphics that we or our partners have created to teach people about the complexities of wildfire management. They are free for non-commercial use, just cite Deer Creek GIS as the source. 2012 has been a very busy fire year in California. Since June, Deer Creek GIS has been committed for more than 100 days of onsite wildfire mapping support on over a dozen major wildfires. We are grateful for the efforts of all of our employees and friends that have been working around the clock to support our operations, and also for the support of our crews’ families, who have put up with their partners being on the road for weeks at a time. We are sharing photos from our fire assignments and travels on Picasaweb at this link. The King Fire, burning on the El Dorado National Forest made a huge run on 9-17-2014, burning over 15 miles and growing 50,000 acres in one day. Here is what it looked like from about 110 miles North. King Fire, 4 pm on 9/17/14.